On February 3rd, the CMA CGM TANYA – the newest vessel of the 536-strong containership fleet of CMA CGM – has called Hamburg for the very first time. 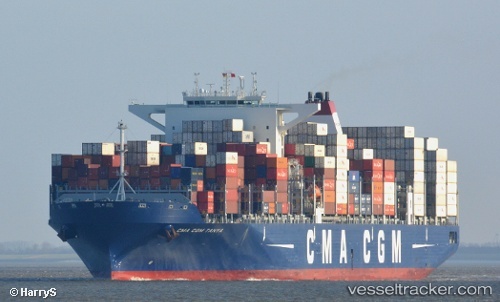 Delivered in 2016, the 300-meter long vessel CMA CGM TANYA will be deployed in the newly introduced EUROSAL XL service where it operates between South America’s west coast and Europe. Moreover, the 10,000-TEU vessel provides perfect conditions for the shipment of refrigerated goods, Port of Hamburg said in its press release. When the CMA CGM TANYA has called at the Burchardkai Terminal in the Port of Hamburg on February 3rd for the first time, it already came a long way: Through the English Channel, across the Atlantic Ocean and through the Panama Canal whose new locks allow the transit of vessels of this size since the completion of the Canal expansion past year. Only delivered in 2016 with a total length of 300 meters and a width of 48 meters, the CMA CGM TANYA is perfectly adapted for the Panama Canal and its new locks. Besides, the ship also qualifies ideally for the navigational challenges and commercial requirements of the EUROSAL XL service where it operates between South America’s west coast and Europe.